I really didn’t mean to take such a long hiatus from posting. Between work and The Eighteen-year-old’s graduation, it’s been a busy spring. 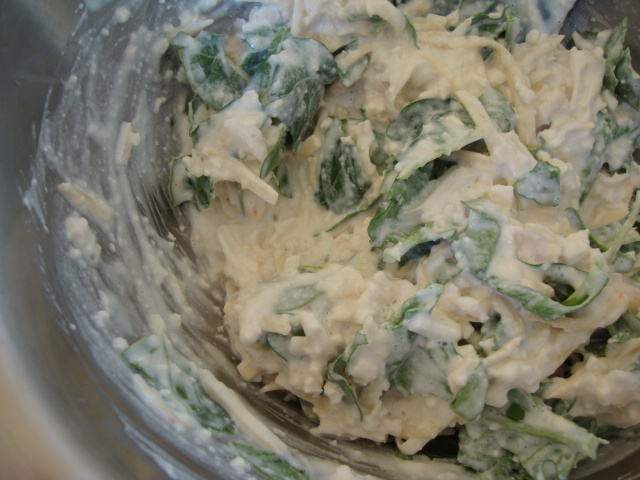 Here’s a quick and yummy recipe that is perfect for enjoying out on the deck. I’ve come learn that there are few rules when it comes to nachos, so here’s my delicious and hearty take on a classic. Preheat oven to 450. 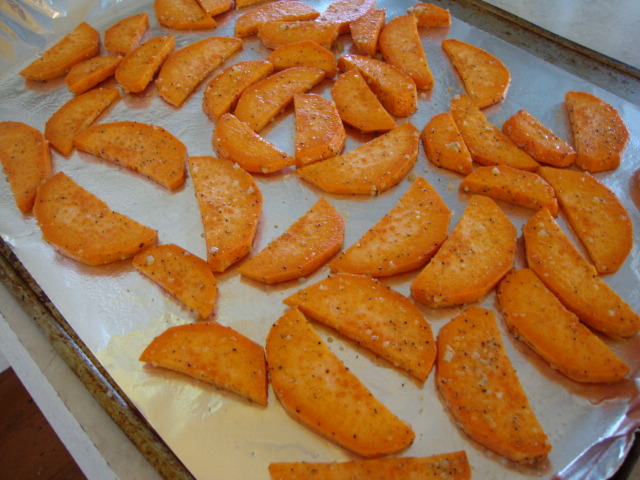 Line a baking sheet with foil and place the sweet potato slices on the sheet. Brush with olive oil and sprinkle with garlic salt and black pepper. Bake for 25-30 minutes, or until tender and browned. 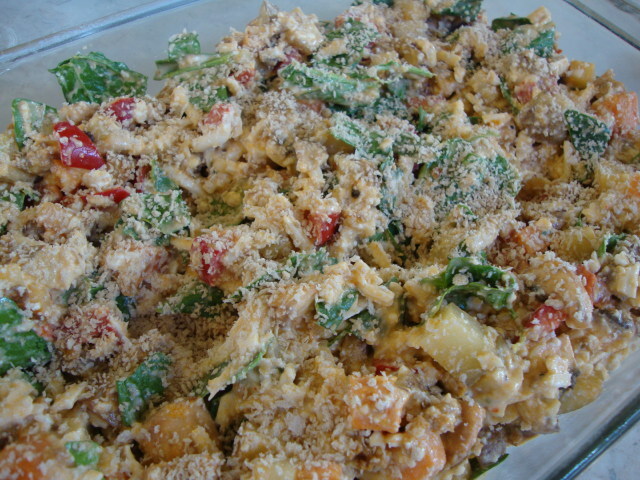 Sprinkle with the vegan cheese and bake another 2-3 minutes, or until the cheese in melted. In the meantime, over low heat, warm the black beans in a saucepan. Combine the sour cream, cilantro, lime juice, and salt in a food processor and blend well. Transfer to a squeeze bottle or bowl. Once the cheese is melted on the sweet potatoes, immediately top 3-4 on individual plates with black beans, sauce, and other toppings. Enjoy! I really didn't mean to take such a long hiatus from posting. Between work and The Eighteen-year-old's graduation, it's been a busy spring. Here's a quick and yummy recipe that is perfect for enjoying out on the deck. I've come learn that there are few rules when it comes to nachos, so here's my delicious and hearty take on a classic. 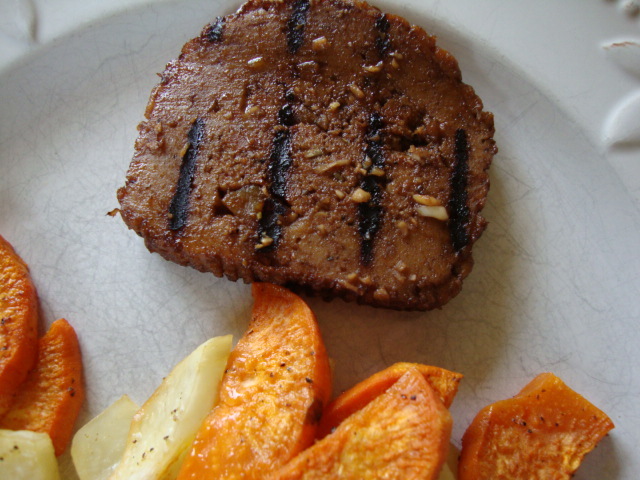 Line a baking sheet with foil and place the sweet potato slices on the sheet. Brush with olive oil and sprinkle with garlic salt and black pepper. Bake for 25-30 minutes, or until tender and browned. 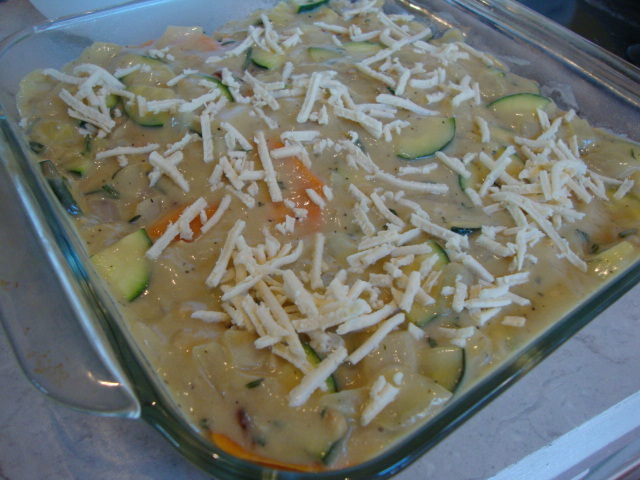 Sprinkle with the vegan cheese and bake another 2-3 minutes, or until the cheese in melted. In the meantime, over low heat, the warm the black beans in a saucepan. Combine the sour cream, cilantro, lime juice, and salt in a food processor and blend well. Transfer to a squeeze bottle or bowl. Once the cheese is melted on the sweet potatoes, immediately top 3-4 on individual plates with black beans, sauce, and other toppings. Enjoy! This is a keeper. Creamy and savory, it’s a satisfying dish that everyone at the table is bound to enjoy. Potatoes and carrots make an ideal sauce for pasta, as we’ve seen with this dish, so why not butternut squash and sweet potatoes? Plus, I had some leftover coconut milk from these aww-mazing vegan peanut butter cup cheesecakes, which was perfect for this dish that was ready in about 45 minutes or less. And did I mention it was gluten-free?! Yes, you may dig in. Preheat oven to 400. 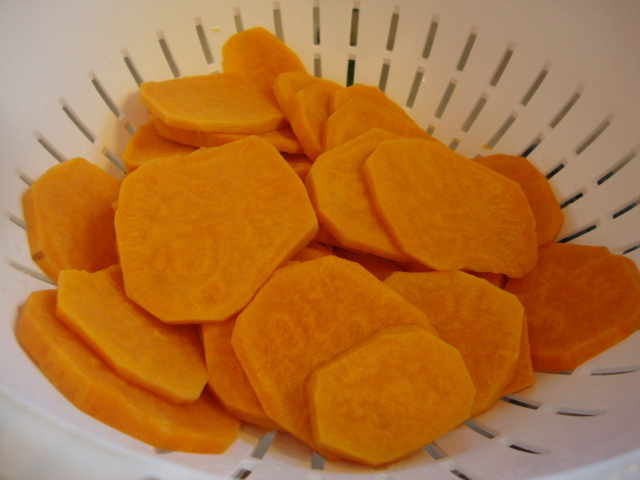 In a medium bowl, combine the squash and sweet potato with about 2 tablespoons of the olive oil, along with some salt and pepper (to taste). Spread out evenly on a large baking sheet and bake for about 25 minutes. Meanwhile, heat the remaining tablespoon of olive oil in a medium skillet and add the onion. Cook the onion for about 10 minutes, and once it starts to brown, add the garlic; cook another 2-3 minutes. Transfer the squash, sweet potatoes and onions to a blender. Add the wine, broth, coconut milk, Dijon, lemon juice, paprika, salt, nutritional yeast, and tamari. Blend several minutes until completely smooth. You’ll probably need to scrapes the sides of the blender once or twice. If it’s too thick, thin it out with a little more broth. Once the pasta is done, return it to the pot and add the sauce. Heat over medium-low heat. Enjoy! This is a keeper. 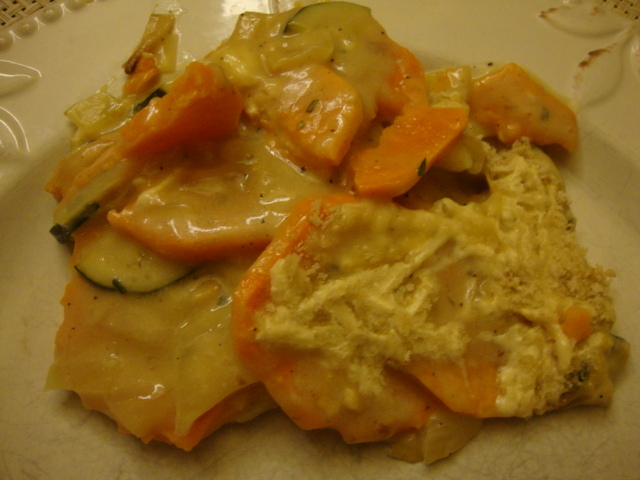 Creamy and savory, it's a satisfying dish that everyone at the table is bound to enjoy. Potatoes and carrots make an ideal sauce for pasta, as we've seen with this dish, so why not butternut squash and sweet potatoes? Plus, I had some leftover coconut milk from these aww-mazing vegan peanut butter cup cheesecakes, it was perfect for this dish, which is ready in about 45 minutes or less. And did I mention it was gluten-free?! Dig in. In a medium bowl, combine the squash and sweet potato with about 2 tablespoons of the olive oil, along with some salt and pepper (to taste). Spread out evenly on a large baking sheet and bake for about 25 minutes. About ten minutes into roasting the veggies, start the water boiling for the pasta. Cook it according to package instructions. I used Ancient Harvest quinoa pasta. Transfer the squash, sweet potatoes and onions to a blender. Add the wine, broth, coconut milk, Dijon, lemon juice, paprika, salt, nutritional yeast, and tamari. Blend several minutes until completely smooth. You'll probably need to scrapes the sides of the blender once or twice. If it's too thick, thin it out with a little more broth. Once the pasta is done, return it to the pot and add the sauce. Heat over medium-low heat. Enjoy! Holy mole! Okay, that was cheezy, but seriously . . . holy mole! 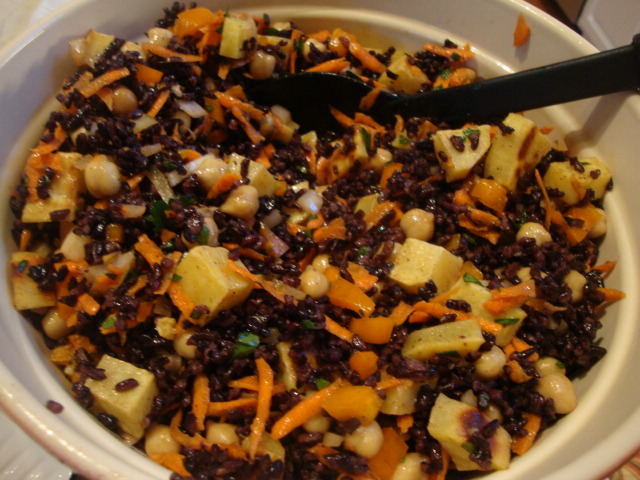 We all know sweet potatoes and black beans go together like peanut butter and jelly, so how about a stew? Oh, and kale? Yes, please. It is officially winter around here and this is the perfect stew for a cold night. And, it’s ready in 30 minutes. No joke. Plus, you can’t beat the immune-boosting powers of kale and mushrooms. Again . . . the perfect stew. 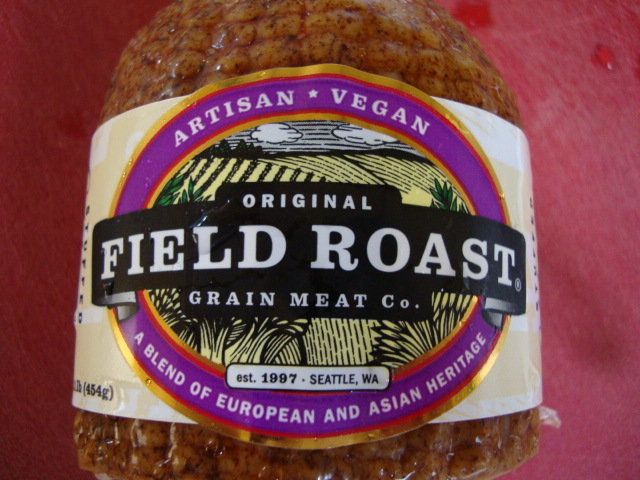 You could dress it up with some cilantro, chives, maybe even some corn chips and vegan cheddar shreds, but why mess with a good thing? (But you can if you want to.) I’m loving this just the way it is. I planned to use different chili seasonings, but then I discovered this mole seasoning in my cabinet from Savory. An idea was born. I love my mole sauce, but the ease of this seasoning won out. I made this stew a bit mild, so feel free to up the ante by adding more cumin and Ancho chili powder. In a large soup pot, heat the olive oil. Add the onion and sweet potato and cook over medium heat until the onions begin to soften. Add the mole seasoning, cumin, Ancho chili powder, and salt. Pour in the broth and let simmer for 15 minutes. Add the beans, tomatoes, mushrooms, and kale, and let simmer another 10 minutes. You may need to add a little more broth or water. Also, add more salt or other seasonings if you feel it needs it. Serve with corn chips and enjoy! Holy mole! Okay, that was cheezy, but seriously . . . holy mole! We all know sweet potatoes and black beans go together like peanut butter and jelly, so how about a stew? Oh, and kale? Yes, please. It is officially winter around here and this is the perfect stew for a cold night. And, it's ready in 30 minutes. No joke. Plus, you can't beat the immune-boosting powers of kale and mushrooms. Again . . . the perfect stew. You could dress it up with some cilantro, chives, maybe even some corn chips and vegan cheddar shreds, but why mess with a good thing? (But you can if you want to.) I'm loving this just the way it is. I planned to use different chili seasonings, but then I discovered this mole seasoning in my cabinet from Savory. An idea was born. I love my mole sauce, but the ease of this seasoning won out. I made this stew a bit mild, so feel free to up the ante by adding more cumin and Ancho chili powder. In a large soup pot, heat the olive oil. Add the onion and sweet potato and cook over medium heat until the onions begin to soften. dd the mole seasoning, cumin, Ancho chili powder, and salt. Pour in the broth and let simmer for 15 minutes. Add the beans, tomatoes, mushrooms, and kale, and let simmer another 10 minutes. You may need to add a little more broth or water. Also, add more salt or other seasonings if you feel it needs it. Serve with corn chips and enjoy! I’ve seen versions of this dish all over, but I wanted to keep this simple. I knew I also wanted a kick of flavor with an easy, creamy sauce. The combo of sweet potatoes, beans, and kale, is a grand slam win; a trifecta of flavors. Of course, then you add the cilantro-lime cashew sauce and it’s icing on the cake, so to speak. These were actually pretty simple to make and will easily feed four to five hungry folks. You can’t go wrong with protein-rich beans, nutrient-laden kale, and the vitamin-packed sweet potato. Eating tacos has never been healthier (or tastier)! Preheat oven to 425. 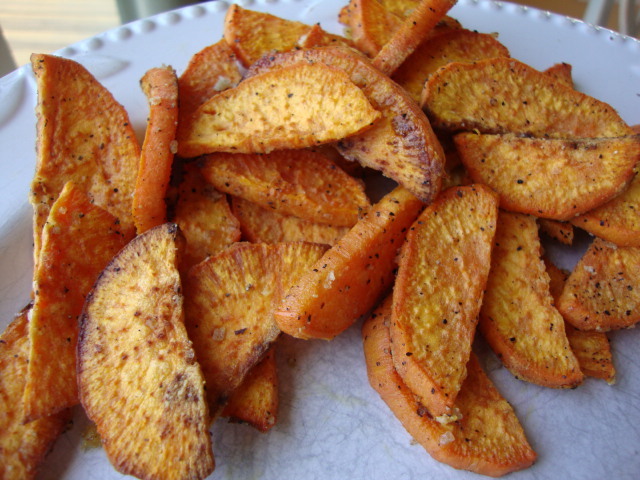 Place the sweet potato pieces in a medium bowl and drizzle with some olive oil. Sprinkle with cumin and chili powder. Toss to coat. 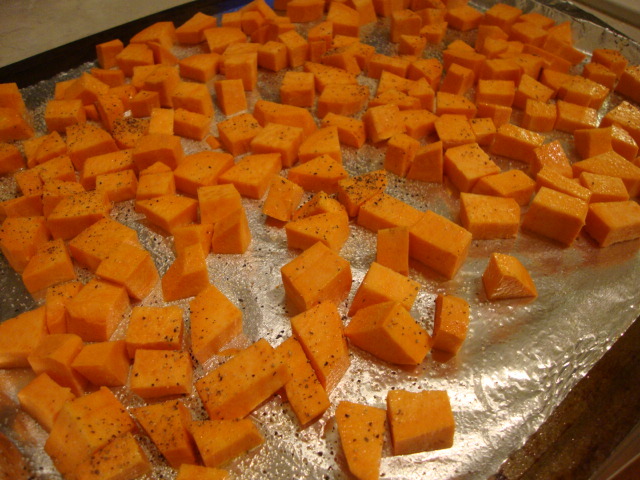 Transfer to a large baking sheet and roast for 20-30 minutes, depending on how big the pieces of sweet potato are. Check them often for doneness. While they are roasting, saute the onion in a large skillet with a little olive oil over medium heat. Once they start to soften, add the black beans. Sprinkle with some cumin, chili powder, salt, and pepper. When the beans started to look a little dry, I added a little lime juice. Then add the sweet potato. Reduce heat to low and fold in the kale. While the kale is slowly cooking down (you can add some more lime juice if things are looking dry), prepare the sauce. Drain and rinse the cashews and throw them in a food processor with the garlic clove. Blend for 5 seconds. Add the remaining ingredients (but don’t add all the water at once; you may want to tweak the consistency of the sauce) and blend until smooth, scraping the sides of the bowl, if necessary. Transfer to a squeeze bottle. To serve, place a scoop or two on a warm tortilla and top with sauce. Enjoy! I've seen versions of this dish all over, but I wanted to keep this simple. I knew I also wanted a kick of flavor with an easy, creamy sauce. The combo of sweet potatoes, beans, and kale, is a grand slam win; a trifecta of flavors. Of course, then you add the cilantro-lime cashew sauce and it's icing on the cake, so to speak. These were actually pretty simple to make and will easily feed four to five hungry folks. You can't go wrong with protein-rich beans, nutrient-laden kale, and the vitamin-packed sweet potato. 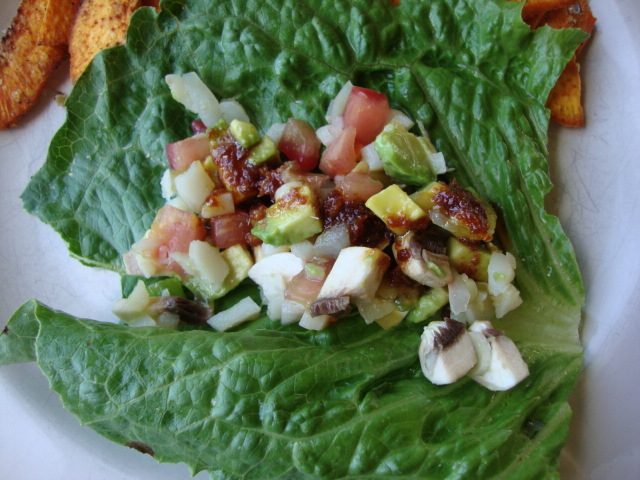 Eating tacos has never been healthier (or tastier)! While the kale is slowly cooking down (you can add some more lime juice if things are looking dry), prepare the sauce. Drain and rinse the cashews and throw them in a food processor with the garlic clove. Blend for 5 seconds. Add the remaining ingredients (but don't add all the water at once; you may want to tweak the consistency of the sauce) and blend until smooth, scraping the sides of the bowl, if necessary. Transfer to a squeeze bottle. To serve, place a scoop or two on a warm tortilla and top with sauce. Enjoy! I was thumbing through Party Vegan for Halloween foods and I was thrilled to find this salad that was not only delicious, but gluten-free as well. It was perfect for our Halloween party. 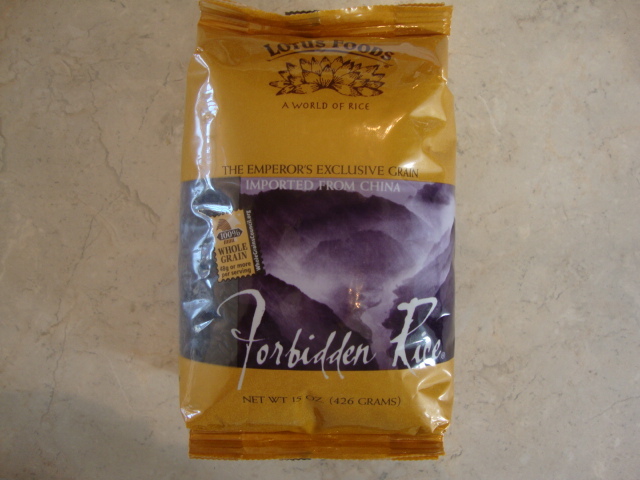 I recommend making the rice ahead of time since it needs to cool in the fridge. It also would hurt to chop up the veggies and cook the sweet potatoes ahead of time, too, so you save yourself a headache of trying to get all done right away. I doubled the recipe, but I’ll list the original recipe amounts below. Also, the original recipe suggests serving the salad on a bed of shredded lettuce, but I opted to serve it in a bowl, sans lettuce. Preheat oven to 425. Spread the sweet potatoes on a lightly greased baking sheet; drizzle with 1 Tbs of olive oil. 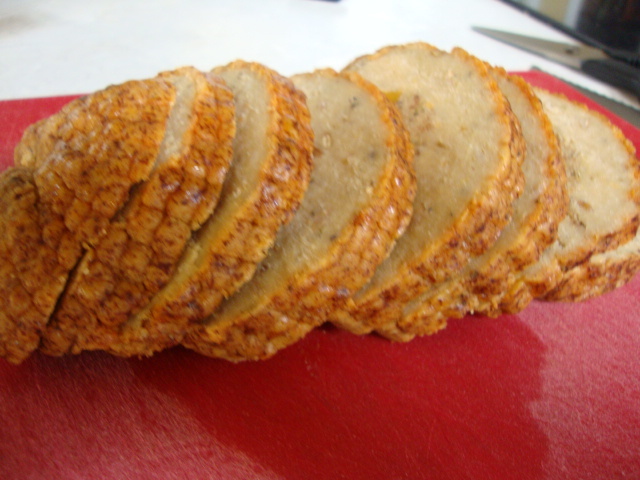 Season with salt and pepper and roast for 15 minutes. 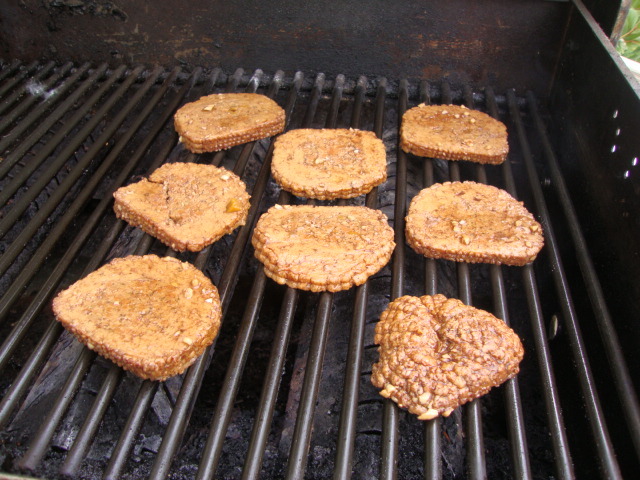 I recommend turning them once halfway through, otherwise, they’ll get too browned on one side. 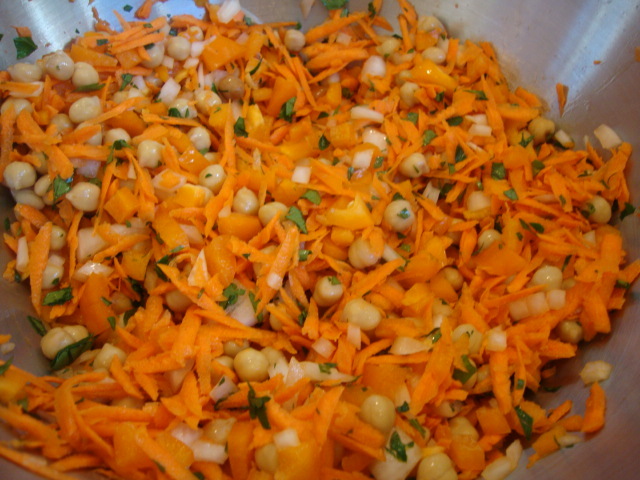 In a large bowl, combine the carrots, bell pepper, onion, parsley, and garbanzo beans. In a small bowl, whisk together the remaining olive oil, lemon juice, garlic, mustard, 1/2 tsp salt, and 1/4 tsp black pepper. The recipe only says to combine the cooled sweet potatoes and rice together, but doesn’t indicate when to mix them in with the rest. But I think I’m a pretty smart cookie and combined everything and tossed it all with the dressing. Enjoy! I was thumbing through Party Vegan for Halloween foods and I was thrilled to find this salad that was not only delicious, but gluten-free as well. It was perfect for our Halloween party. I recommend making the rice ahead of time since it needs to cool in the fridge. 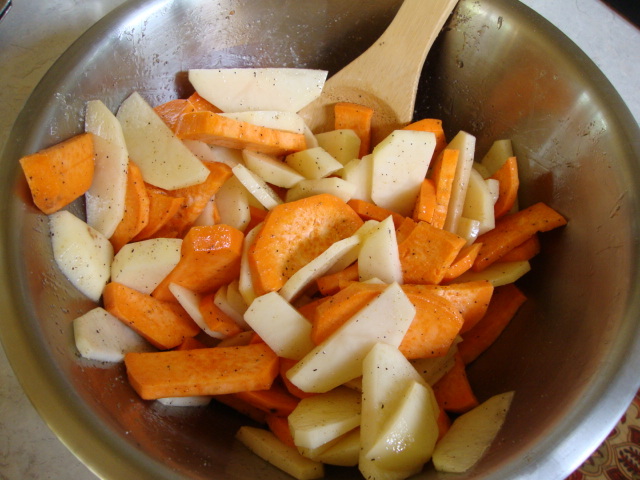 It also would hurt to chop up the veggies and cook the sweet potatoes ahead of time, too, so you save yourself a headache of trying to get all done right away. I doubled the recipe, but I'll list the original recipe amounts below. Also, the original recipe suggests serving the salad on a bed of shredded lettuce, but I opted to serve it in a bowl, sans lettuce. Spread the sweet potatoes on a lightly greased baking sheet; drizzle with 1 Tbs of olive oil. Season with salt and pepper and roast for 15 minutes. I recommend turning them once halfway through, otherwise, they'll get too browned on one side. In a small bowl, whisk together the remaining olive oil, lemon juice, garlic, mustard, ½ tsp salt, and ¼ tsp black pepper. 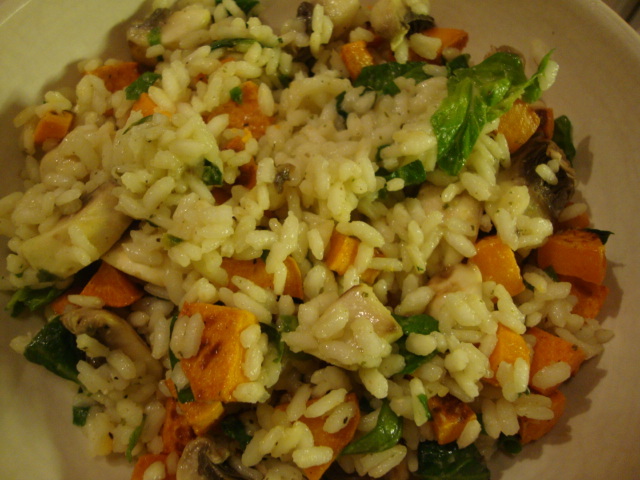 The recipe only says to combine the cooled sweet potatoes and rice together, but doesn't indicate when to mix them in with the rest. But I think I'm a pretty smart cookie and combined everything and tossed it all with the dressing. Enjoy! I found myself with several yams and sometimes, I don’t always know what to do with them. So why not scalloped potatoes? I threw in some zucchini and onions, and topped it with some Daiya and panko. Delicious! Preheat oven to 350. Boil the yams in a large soup pot for about 10 minutes, or until tender. Drain and set aside. Meanwhile, heat the olive oil and garlic. Add the onions and cook 3-4 minutes. 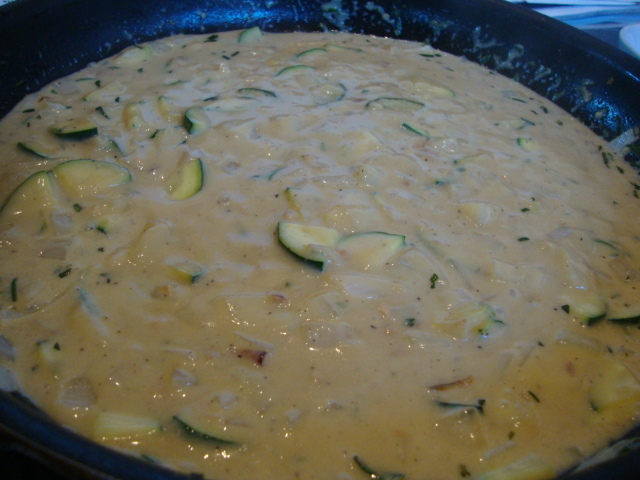 Add the zucchini and cook until softened. Add the seasonings. 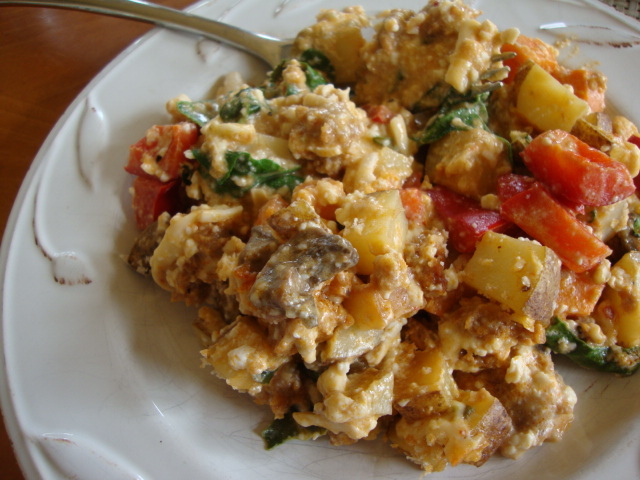 Whisk together the milk, arrowroot, and nutritional yeast. 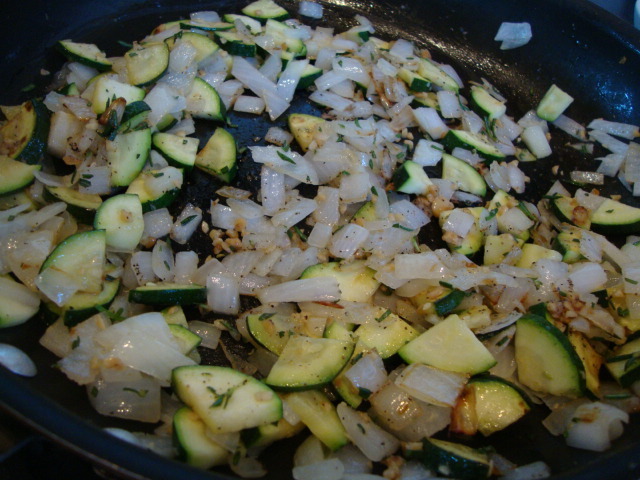 Pour it into the skillet with the onions and zucchini. 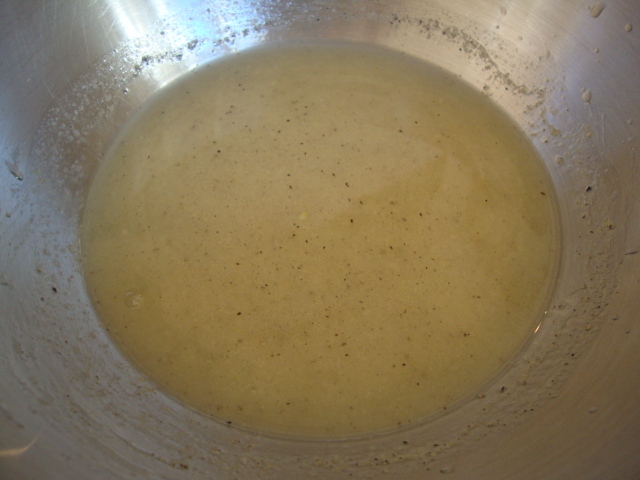 Stir continuously until the sauce begins to thicken. 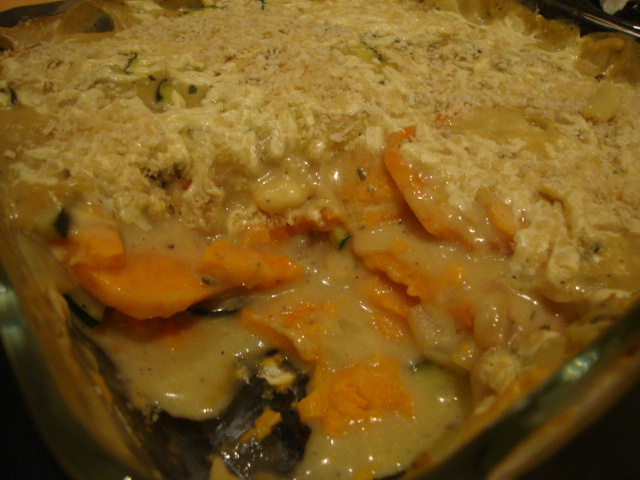 Layer half of the yams into an 8″ baking dish. Pour half of the onion mixture on top and spread evenly around. Layer on the rest of the yams, then the mixture. Top with some cheese. Cover and bake for 15 minutes. Uncover, sprinkle with the panko and bake another 15-20 minutes. Enjoy! I found myself with several yams and sometimes, I don't always know what to do with them. So why not scalloped potatoes? I threw in some zucchini and onions, and topped it with some Daiya and panko. Delicious! Layer half of the yams into an 8" baking dish. Pour half of the onion mixture on top and spread evenly around. Layer on the rest of the yams, then the mixture. Top with some cheese. It’s the morning of day 5 of my Reboot and I feel great, especially since I’m even down 5 pounds! I definitely don’t feel as weak and tired as the last few days, not as hungry either. Mentally, I feel clearer and less foggy–able to concentrate longer. Last night we went and saw Harry Potter and we usually go for some popcorn . . . I know, terrible (btw, did you know (according to the latest VegNews mag) that a large movie popcorn–without butter–is 1,050 calories?!) Anyway, the boys finished a vat of popcorn before the movie even started, but I wasn’t tempted to eat any. Wow. That never happens! I’m determined to continue this reboot through Sunday and after that, I plan on making a lot of changes, such as no alcohol, little oil, little gluten, and very little processed foods. That’s the goal at least. Yesterday, I had a class at the NCW and then worked in the studio for the afternoon, so I needed to come prepared. With salty snacks and soda in the fridge just ten feet from me, I had to arm myself with good food. 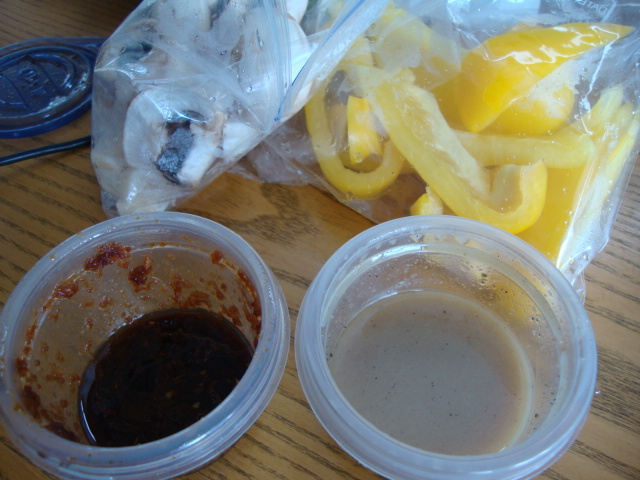 I made a salad, packed some jicama, yellow bell peppers, and mushrooms and dipped them in dressing. The dressing recipes are from the JointheReboot site. Having both dressings changes things up—it’s great so that you don’t get sick of one. For dinner, I made sweet potato “fries” also from the Reboot site. They were delicious! Preheat oven to 425. 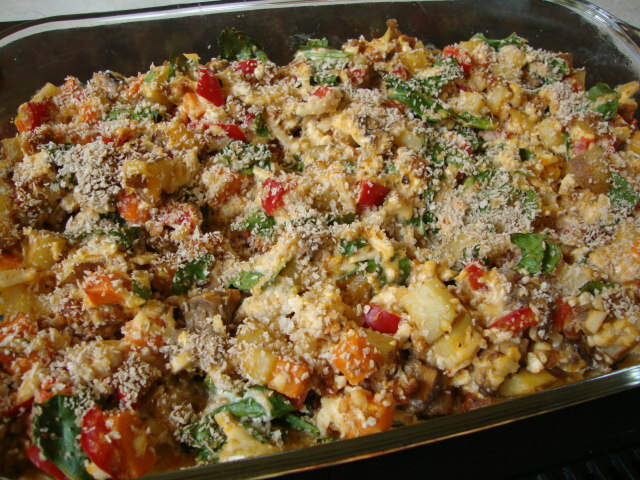 Combine the sweet potatoes with the rest of the ingredients and coat well. Layer onto a baking sheet lined with parchment paper or foil. Bake for 25-30 minutes. 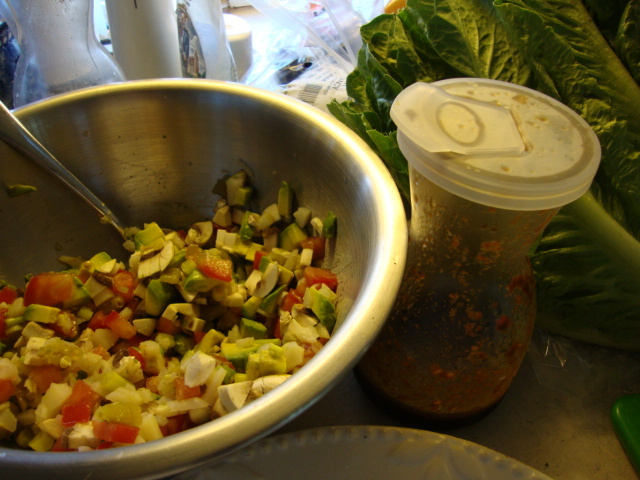 Combine all the veggies and top the lettuce leaves with a couple of spoonfuls of them. Drizzle with the Ginger dressing. So good! So this morning . . . I find that fruit smoothies are the easiest way to start the day. 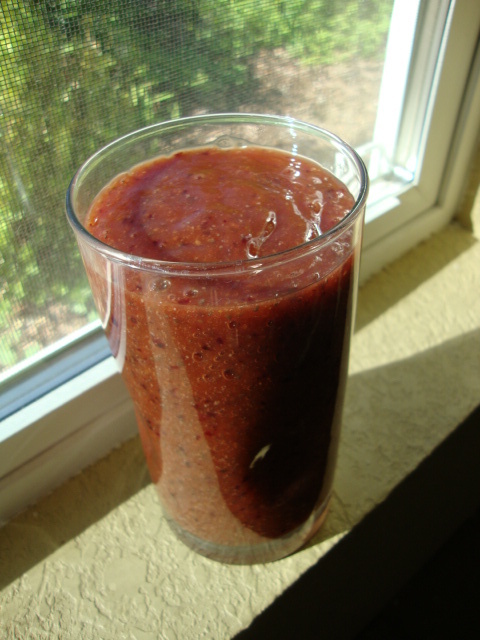 I blended up a mango, 1/2 a cup of fresh cherries (I removed the pits first) and about a cup of water. Awesome. So, I’ll keep going and continue to try different recipes. I’ll keep you posted on my progress—thanks for traveling along with me! Yesterday’s nearly 80 degree day turned to a cloudy and soon-to-be rainy day today, so a breakfast casserole seemed quite appropriate for the morning. It didn’t disappoint and has proved to be ideal for a cozy day in. Turn it into a breakfast burrito by wrapping some up in a flour tortilla. Preheat oven to 350. Lightly spray a 13″x9″ baking pan with cooking spray; set aside. 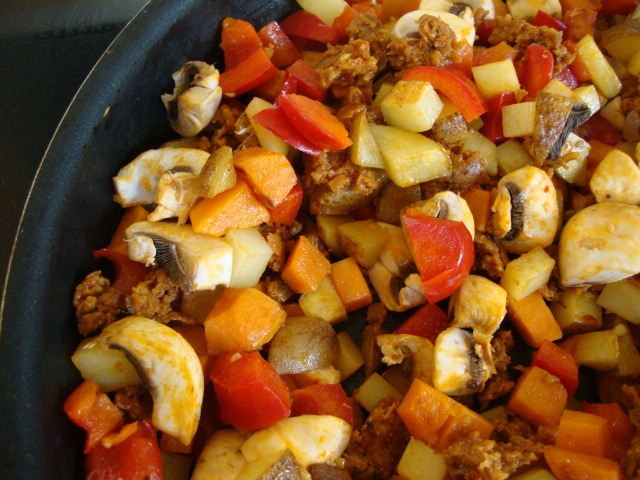 In a large skillet, heat the olive oil and add all of the potatoes. Cook, covered, on medium heat for 15 minutes, or until they just begin to soften (stir them often). Add the bell pepper and Field Roast; cook another 5 minutes. Meanwhile, in a large bowl, whisk together the tofu, cheeze, sour cream, nutritional yeast, and almond milk. Stir in the spinach. 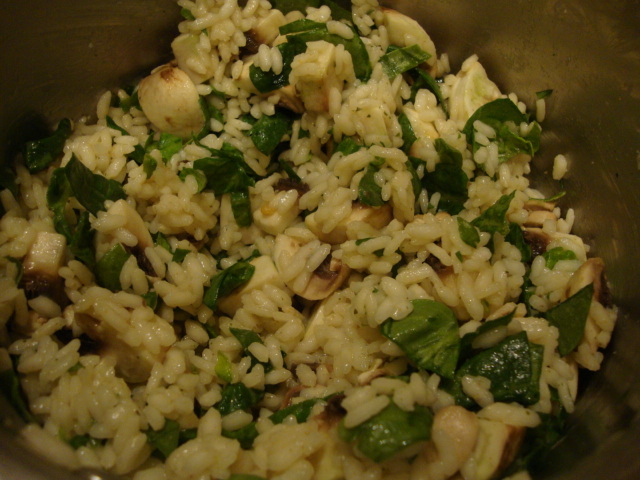 Add the mushrooms to the skillet and cook until they begin to soften, 2-3 minutes. 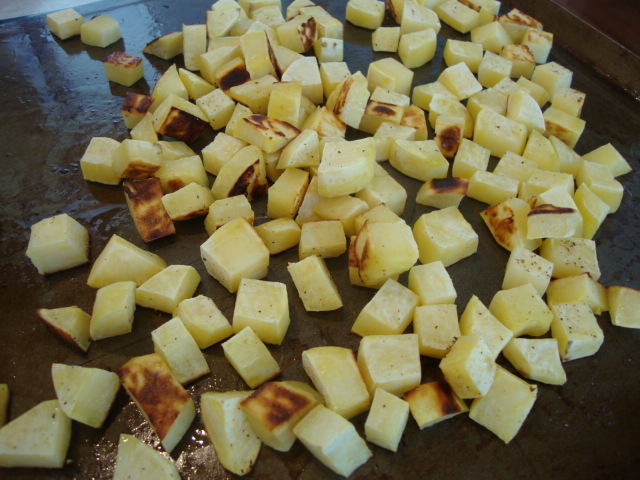 Then combine the potato mixture to the tofu mixture and stir well to combine. Pour mixture in the pan and top with the panko. Cover and bake for 30 minutes. Uncover and bake another 5 minutes. Let sit a few minutes, then dig in and enjoy! Yesterday's nearly 80 degree day turned to a cloudy and soon-to-be rainy day today, so a breakfast casserole seemed quite appropriate for the morning. It didn't disappoint and has proved to be ideal for a cozy day in. Turn it into a breakfast burrito by wrapping some up in a flour tortilla. Preheat oven to 350. Lightly spray a 13"x9" baking pan with cooking spray; set aside. 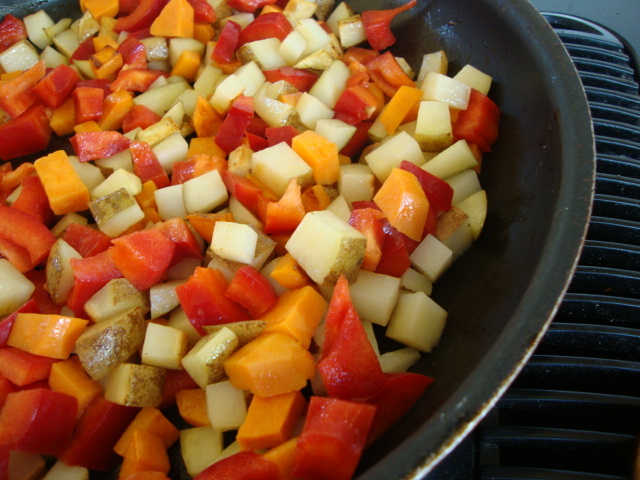 In a large skillet, heat the olive oil and add all of the potatoes. Cook, covered, on medium heat for 15 minutes, or until they just begin to soften (stir them often).